The discussion in the box below was contributed by a reader of this website. 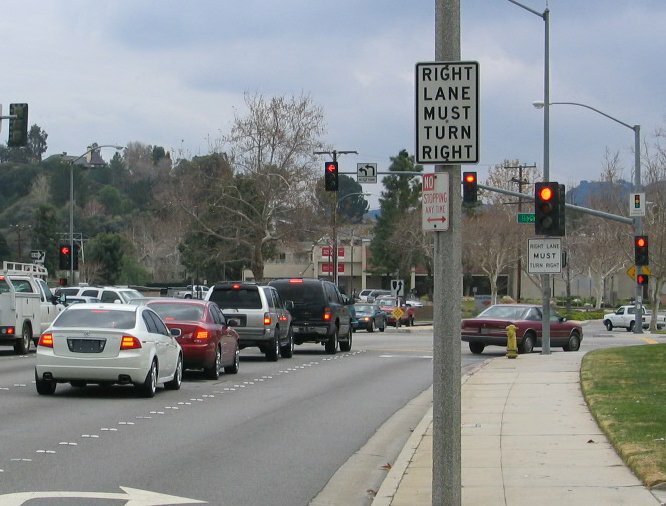 The warning sign pictured above on the far side of the intersection, appears to violate the CalTrans rule (see box below) that signs should not be installed on signal standards, and also could be too small. 21455.5(a)(1)'s "visible to traffic approaching" language is used as a focus point for this discussion. It's noted that use of the connective word "and," between the phrases "clearly indicate the system's presence" and the term "visible," means that said phrase and term each have the same grammatical function. That is to say, an SR56 sign must "clearly indicate the system's presence," and must also be "visible" to traffic approaching. If an SR56 sign fulfills only one stated condition, then the intersection may not legally be considered to be an intersection "equipped with an automated enforcement system." The term "visible" has a number of meanings. The words "clearly indicate" appear ahead of "visible." Consequently "visible," as it is used in CVC 21455.5(a)(1) has to mean more than simply perceptible or discernible, and must mean at least, obvious and conspicuous. When considering what "clearly indicate" might mean, being as the said SR56 sign in and of itself must necessarily comply with signage rules as to construction, and even if a sign and its text are each of a proper size and color, if it is not properly placed, it will not be capable of "clearly" indicating anything. The controlling authority on sign placement is the Manual On Uniform Traffic Control Devices (MUTCD). Therefore, if the placement of a properly constructed sign complies with all requirements of the MUTCD, it can be said to "clearly indicate" its information, and if it violates any MUTCD requirement, it cannot be said to "clearly indicate." The MUTCD is available at the CalTrans website, and that online/electronic version is the official version. The pages referenced immediately following are found in the official Signs manual (24 MB file), Nov. 2014 edition. "Guidance: The installation of signs, including route shields, on signal standards should be avoided unless they directly affect traffic movements in the intersection." "NOTES. These sign positions are typical and should be considered a standard. When physical conditions require deviation from these typicals, they should be documented." "Signs should be located on the right side of the roadway where they are easily recognized and understood by road users. Signs in other locations should be considered only as supplementary to signs in the normal locations, except as otherwise provided in this manual." "Option: Under some circumstances, such as on curves to the right, signs may be placed on median islands or on the left side of the road. A supplementary sign located on the left-hand side of the roadway may be used on a multi-lane road where traffic in a lane to the right might obstruct the view to the right." "The minimum height, measured vertically from the bottom of the sign to the elevation of the near edge of the pavement, of signs installed at the side of the road in rural areas shall be 5 feet (see Figure 2A-2)." "The minimum height, measured vertically from the bottom of the sign to the top of the curb, or in the absence of curb, measured vertically from the bottom of the sign to the elevation of the near edge of the traveled way, of signs installed at the side of the road in business, commercial, or residential areas where parking or pedestrian movements are likely to occur, or where the view of the sign might be obstructed, shall be 7 feet (see Figure 2A-2)." "The minimum height, measured vertically from the bottom of the sign to the sidewalk, of signs installed above sidewalks shall be 7 feet." The Photo Enforced sign is a "regulatory" sign, so the height exception provided for "secondary" signs (in Paragraph # 06) does not apply. "Except as provided in Paragraph 1 below, Traffic Signal PHOTO ENFORCED (SR56(CA)) sign shall be placed at all traffic signals where an automated traffic enforcement system is used." "Option: A Traffic Signal PHOTO ENFORCED (SR56(CA)) sign (see 2B-3 (CA)) may be installed at a jurisdictional boundary, including all major entrances (at a minimum, freeways, bridges, and state highway routes) to advise road users that some of the traffic regulations within that jurisdiction are being enforced by photographic equipment."